↑ Social Statistics Department of Latvia. "Latvijas iedzīvotāju etniskais sastāvs" (PDF). Social Statistics Department of Latvia. पहुँचतिथी 21 June 2015. ↑ "The number of population is decreasing – the mark has dropped below 2 million". Central Statistical Bureau of Latvia. Nov 2015. पहुँचतिथी 6 May 2014. ↑ "Population Census 2011 – Key Indicators". Central Statistical Bureau of Latvia. 2 April 2012. पहुँचतिथी 2 June 2012. 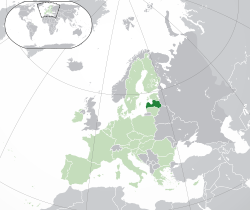 ↑ 4.0 4.1 4.2 4.3 "Latvia". IMF.